Junior, Jeremy Soine, has had an extremely successful career in FFA. For Cannon Falls Junior, Jeremy Soine, being apart of Future Farmers of America (FFA) has sculpted him into who he is today. His passion for the activity developed as he was about to enter his freshman year of high school, when he attended State Greenhand Leadership Camp (SGLC). “FFA is full of amazing experiences that push you outside of your comfort zone, and that’s where I strive. Being able to attend SGLC was such an amazing experience for me because I made so many new friends that I still talk to today,” Soine mentions. Participating in group volunteer service projects, such as the annual community ditch clean up that the Cannon Falls FFA Chapter takes part in, has also allowed Jeremy to establish strong friendships with others. Currently being in his fifth year of FFA, Soine recently transferred to the crops category after he competed in the poultry category for the past couple of years. Last year his poultry team advanced from regionals to state and was able to receive a gold ranking at state. This year’s crops team will also be state returners as they have been regional champions for the past four years and were last year’s state champions. Both teams that Jeremy has competed with were also fortunate enough to attend the 2017 National FFA Convention that was held at the Indiana Convention Center in Indianapolis, Indiana. Although FFA has become Jeremy’s most prioritized activity, it wasn’t always this way. When he was in middle school, FFA was an activity that Jeremy wasn’t too familiar with. Ever since Jeremy attended SCLC for the first time during his freshman year, one of his goals was to become a region officer. After he saw how motivating all of the officers were at SCLC, Jeremy began to run for state office positions. “I am excited to be able to experience Greenhand Camp over the summer again and to get to meet all of those members and leave a lasting impact on all of the members in FFA. I am also looking forward to serving the 800 plus members within Region VIII FFA,” Soine states. Through his position on the officer team, Jeremy has the opportunity to visit our nation’s capital. This upcoming summer Jeremy will fly down to Washington DC for the Washington Leadership Conference, WLC, where he and other officers will learn more about politics in a way that agriculture ties in with it. 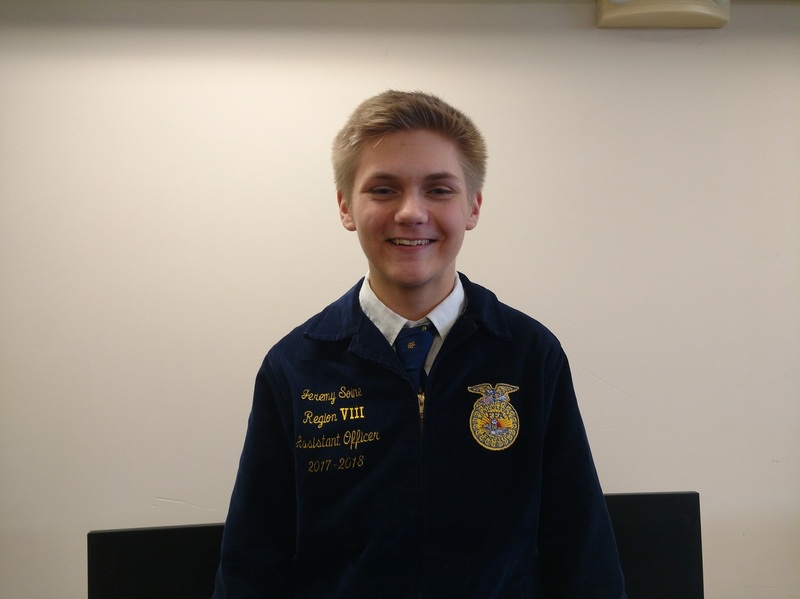 Following several years of experience in the field of agriculture on his FFA team, Jeremy plans on going into a career of agriculture education and agronomy after high school. To study these professions, he plans on attending the University of Minnesota either in the Twin Cities or in the city of Crookston.